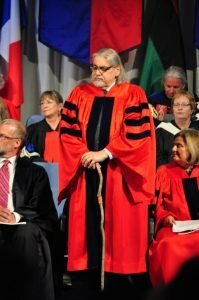 Dr. Rick Tobias, one of Canada’s best-known advocates for low-income and marginalized people, was granted an honorary Doctor of Divinity by Acadia University during the Faculty of Theology and Faculty of Arts Convocation ceremony on Sunday, May 14, 2017. For more than 35 years, Rick Tobias has encouraged and inspired people living in poverty to recognize their worth and to realize their potential while also challenging church communities, business and professional leaders, and elected officials to understand their roles in responding to human need. As an instigator of pioneering initiatives, he opened a centre for youth on the streets, created employment programs, opened a health care centre, built a computer literacy facility and program for school children, and introduced a community development model while expanding the ministry into other neighbourhoods. A native of Saint John, New Brunswick, Rick is a two-time graduate of Acadia University, completing a Bachelor of Arts (’76) and a Master of Divinity (’81). Upon graduation, Rick returned to Saint John where he founded Baptist Inner City Ministries, leading city churches to connect with people who experienced poverty and its effects. He then studied and taught urban mission through SCUPE (Seminary Consortium for Urban Pastoral Education) in Chicago. In 1983 he began his ministry at the Yonge Street Mission in Toronto, serving first through opening the Evergreen Centre for Street Youth and from 1989-2012 as President and CEO. With his leadership in demonstrating love, peace, and justice to people living with economic, social and spiritual poverty, Rick brought radical change to established ways of serving those in need, and the Yonge Street Mission became a leading urban ministry in North America. Rick’s sincere desire is that Yonge Street Mission will not only serve its community, but also transfer its knowledge to new leaders and organizations, so they can also change their communities. Across Canada, Rick has shaped the emotional and spiritual response to poverty, neutralizing fears and prejudices on all sides. His belief that each person is created in the image of God has been foundational to his work. His conviction about the worth of every person, and the commonality among them, has been instrumental in creating inclusive communities, regardless of status, wealth, or power. Rick clears common ground that connects people to people, in helping communities break the cycle of poverty. Rick’s significant contribution has been recognized by several institutions, including the awarding of honorary degrees by McMaster University, Humber College, and York University. 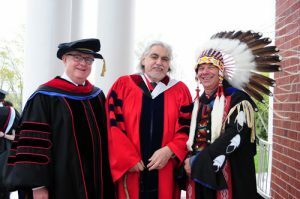 It is most fitting that Acadia University, his own alma mater, recognized the extraordinary impact that he has made in our country by challenging and changing the face of poverty and marginalization for thousands upon thousands of Canadians, for this generation, and the next.